Love is all around, Frisco! There are tons of fantastic Valentine’s Day events and menus this week, so find someone you care about and paint the town YOU! Also, you can do a little networking this week or catch a youth theater performance. All of this and more, This Week in Frisco! Momma MeetUP: 7:00 am at UP Inspired Kitchen. Jump start your week with Momma Meet UPs at UP! They’ll have special surprises each week along with $3 Kid Cakes, $5 UP Cakes, $2 mimosas, $3 Kombucha, and 1/2 off specialty coffee. Women Enhancing Business Lunch: 11:30 am – 1:00 pm at Hall Park. WEB has a mission to provide female business owners, managers, and employees the opportunity to meet, advise, support, mentor, network and encourage one another in order to promote the success of their businesses, as well as providing opportunities for the members and guests to connect and learn more about the community. Mayor’s Business Round Table: 11:30 am – 1:00 pm. The first MBRT of the year, the topic of discussion is corporate social responsibility. Mayor Cheney will be discussing the necessary role of the private sector in our community and the guest panelists will discuss why CSR is not only a core value but a strategy. UPDATE: This event is full. Please email Lorie@mayorcheney.com to be placed on the waiting list. Inspire Frisco: 4:30 pm. Inspire Frisco is excited to announce their next event, a talk with Dave Gorman, active entrepreneur and a Managing Partner at Step 5 Capital. Grit and a Guitar: An Evening with Tony Memmel: 6:00 pm – 7:30 pm at the Frisco ISD Admin Bldg Board Room. Tony Memmel will share the importance of hard work, overcoming adversity, connecting with your community, and building friendships. An award-winning musician, songwriter/composer, and ambassador for the Lucky Fin Projec, Tony also happens to have been born with one hand. This event is open to parents and students ages 8+. Beyond Studios Frisco: Celebrate Galentine’s Wine Wednesday at Beyond! Participate in the 5:30 pm or 6:30 pm classes and Gina Lynn of Dancing Backwards in Heels will be there to cheer you on and pour wine after class (like a true gal pal)! Texas Legends: 7:00 pm at Comerica Center. The Texas Legends versus South Bay Lakers. Looking for Valentine’s Day events, gifts, and menus? Check out our Guide to Valentine’s Day in Frisco! Valentine’s Red Carpet Concert: Celebrate Valentine’s DayVIP style! Enjoy an intimate concert featuring America’s #1 Romantic Pianist and the “Pianist to the Presidents,” David Osborne! It will be an unforgettable Night of Romance! Tickets include wine, signature cocktails, heavy hors d’oeuvres, and tasty desserts. Seating is limited, so get your tickets today. UPDATE: This event is sold out. Stay tuned to the Frisco Arts website for future events! The Art of Cupid Celebration: 7:00 pm – 9:00 pm at Frisco Fine Art. Chef Eustace Weaver will be in attendance for an amazing evening of delectable delights, amazing wines from our California boutique winery partners, live music, art, and all of the energy of Frisco Fine Art. NTPA-Frisco Presents Once on the Island JR: 7:15 pm at Frisco Discovery Center. With its poignant story and catchy Caribbean-flavored score, Once on This Island JR. is a highly original theatrical adaptation of Hans Christian Andersen’s popular fairy tale, The Little Mermaid, and the Tony-nominated Broadway musical. Chunk Your Junk: 8:00 am – 12:00 pm at 6616 Walnut Street, Frisco. Residents may bring qualifying items for safe disposal, recycling or donation. Please review the list of items here. 2019 Hope for Your City Gala: 6:00 pm – 9:00 pm at the Renaissance Dallas at Plano’s Legacy West. Make hope real as you support Hope’s Door New Beginnings with an evening of dinner, dancing, and a silent auction. Proceeds from the Gala help to fund services for survivors of domestic abuse, dating abuse and family violence in our community. Finding New Forever Homes: 12:00 pm – 4:00 pm. Lincoln Experience Center at The Star is joining forces with Collin County Animal Services to find forever homes for pups and dogs in the Frisco area! With different breeds, sizes, ages, and personalities to choose from, you’ll have the opportunity to find your perfect match with onsite, same-day adoption. NTPA-Frisco Presents Once on this Island JR: 2:15 pm at Frisco Discovery Center. With its poignant story and catchy Caribbean-flavored score, Once on This Island JR. is a highly original theatrical adaptation of Hans Christian Andersen’s popular fairy tale, The Little Mermaid. eMLS League Series Two Presented by Playstation: 4:30 pm – 9:30 pm at the National Soccer Hall of Fame. Featuring 22 of the best professional FIFA 19 gamers from across the U.S. and Canada, each representing their local MLS Club, vying for a shot at the Series Two title. Food, beverage, and more. 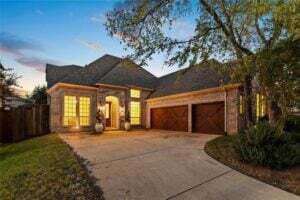 608 Braxton Court, McKinney, TX, 75071: Wonderful cul-de-sac home in sought after Stonebridge Ranch. Inviting entry with a two-story ceiling and a large foyer. Dining room off entry with pass through to an open kitchen and living combo. Major League Roofing: Get $1,000 off roof replacements, $250 roof rejuvenation packages or earn $100 for each referral with Major League Roofing. Call (469) 708-ROOF or Use code “lifestylefrisco” on mlroof.com; certain restrictions apply. Growing IQ – Help your child discover math concepts! Book a FREE math trial class with Growing IQ and get a 15% discount by mentioning “LIFESTYLE FRISCO” when you register. Practical Fitness: Valentine’s Day “Couple Certificate”: 1-Hour Consultation + 3 private, personal training sessions for only $100.00 and the buyer also gets a 1-Hour Consultation + 3 private, personal training sessions! Sweets on a Stick: Use promo code lifestyle for 20% off all Valentine’s items including classes at Sweets on a Stick! Cherry Blow Dry Bar: Planning a night out? Come in for a wash, blowout and a full face of makeup for only $80! Mochas and Javas: Celebrate Mochas and Javas “Sweet 16” this February, Saturday the 9th with 16 cent (16oz) drip coffee, 16% off all handmade beverages, and 16% off all Mocha’s merchandise! BEYOND Pilates Studio: New Clients, Make a #NewRearResolution and Get 2 Unlimited Weeks for $59. Working out will never be boring again! Sign up today. Boxcar House: Boxcar House is offering 20% off of all accessories (in stock) for the month of February! Freshii: Free Chips & Guac platter with your catering order of $100 or more! Monat Hair Care: Get a FREE gift (worth $25) AND a 15% DISCOUNT with FREE shipping on your favorite products! Take the hair quiz or ask Lisa how to improve your hair. Leadership Prep School: Open Enrollment for Leadership Prep School (LPS) is Monday, February 4 – February 22. Lewis Pain Management: Mention Lifestyle Frisco for a FREE CONSULTATION to discuss regenerative medicine! Oasis Accents: Shop new markdowns on home accessories, art and small furnishings, up to 50% off. Serendipity Labs: Complimentary Day Pass OR 20% off your first meeting. The 12: Exclusive Founder’s Rate – $129/month for Unlimited Group Classes at The 12. Register by 3/30/2019 to secure this offer. Email Plano@The12.com. The Cell Spa: Mention Lifestyle Frisco for a Complimentary Consultation. Trinity Oaks Mortgage: Finance the cost of a pool or outdoor space with a Pool Escrow Loan through Trinity Oaks Mortgage and receive a free upgrade AND 10% off of retail discount with our preferred pool partner, King Pools, Inc.
Tumbleweed TexStyles: Take an additional 40% OFF already reduced items from the SALE Collection when you use code FRISCO40. Jungle Joe’s: Happiest Hours are at Jungle Joe’s! Monday – Thursday 2pm-6pm, get $2 off admission for each child, and, purchase a meal from Joe’s Cafe and BOGO 50% off your second meal. Frisco School of Music and Performing Arts: Valentine Special: One Free Lesson for your Sweetie Ages 4 – Adult. Call 214.436.4058 and register for one FREE Lesson before 8 pm Thursday, February 14 to get this Sweetheart of a Deal! 10th Annual Arts in the Square: March 30-31, 11:00 am – 6:00 pm in Frisco Square. A juried Fine Arts and Crafts festival featuring over 120 of the best local and regional artists selling their handmade creations. HeartStories “You’re in Luck GNO”: March 7, 6:30 pm – 9:30 pm at Serendipity Labs. Gather your girlfriends for a well-deserved night of food, wine, laughter, and a long deep breath away from all the stresses of your day. You might not leave with a pot of gold, but you’ll certainly leave with some green and feeling reconnected, refreshed and prepared to meet opportunity when it knocks. Frisco Uncorked: April 6, 12:00 pm – 6:00 pm. Frisco’s first a food + wine festival experience that features over 20 wineries from TX and CA, delicious food from Frisco restaurants and food trucks, 3 bands, talented artists, beer and cocktails, a play area for kids and 50+ boutiques, local businesses, and shops! The festival is free and family friendly with wine and food tasting tickets available for purchase! Lifestyle Frisco is proud to be the official media sponsor of Frisco Uncorked!